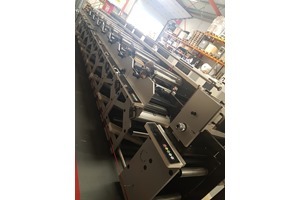 This flexo press is designed to ensure optimum efficiency combined with the highest level of quality. The new, innovative clean-hand design features the shortest possible web path, easy-loading of tooling, and the Nilpeter CLEANINKING system. Combined with a new Nilpeter PowerLink control system, this enables the label and flexible packaging printer to achieve the leanest performance in today’s competitive market. Moreover, the press is prepared to meet the increasing, global trend towards short run jobs and small repeat lengths. The FA-4* tolerance standard and dot gain coverage are as impeccable as the current FA-Line, making it the best choice for any quality conscious printer seeking to maintain the competitive advantage. Available in 16” and 17", the new FA-4* can easily be combined with the Nilpeter ancillary program and value-added units.